Stephen Curry can make the most amazing shots look routine, but even this is ridiculous! A 62-foot bomb from beyond the 3-point line on THE OTHER END OF THE COURT to beat the third quarter buzzer, and IT HITS NOTHING BUT THE INSIDE OF THE NET!!! 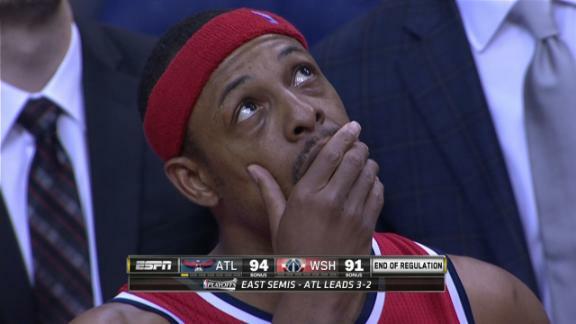 Gotta feel for Paul Pierce, though. Buzzer beating 3 to tie the game and force OT waved off for being a split-second too late, and his Wizards get knocked out of the playoffs. This after his "game winning" shot in Game 5 was answered by Atlanta's game winning offensive rebound and put-back. Pierce had a buzzer beater in game 3 to win it for the Wizards. Then, what we all thought was a game winning shot in game 5 was rectified by a put back at the last second by Hortford, just a few short seconds after Pierce was done showing his rear end by yelling "Series!!! Series!!!" at the Hawks bench and fans. Last night in game six, we saw yet another display of justifiable arrogance right after a supposed game-tying three pointer, only to be overturned shortly after. Im ecstatic right now, only because this isnt what we expect in Atlanta. As soon as he hit that shot last night, the bar I was at went silent. Atlanta had just "Atlanta-ed" yet again. We're all used to it here, and we kinda expect it. BUT NO!!! SOMETHING WENT OUR WAY!!!! THE SHOT WAS TOO LATE!!!! Everyone in the pub went insane after that. We arent done yet. Who knows how much more we have left in the tank. But when good things happen, we might as well enjoy it. We know better than to get used to it though! Wrong again! Paul Pierce is the victorious avatar of Shklorg! Los Angeles: Home of the Chokers and the Fakers. Meanwhile in the NFL, a point after touchdown kick will now be snapped from the 15, and a point after touchdown attempt (either a blocked kick or turnover on a 2-point conversion) can be returned by the defense for 2 points. TURN UP FOR THE HAWKS TONIGHT!!!!!!!! Wythenshawe Town, who play in one of the lower tiers in English soccer, recorded a perfect 39-0 season. Way to go. That means that they're going up a level. Good on them! Hopefully they eventually reach the Premier League. GOLDEN STATE wins game one in OT! Hate to see Irving go down. Tough blow for the Cavs. But once again Lebron proves that he's not in Jordan's company. He had 24 seconds left with the ball in a tie game and he couldn't close the deal. And then he completely disappeared in OT. He also failed to keep J.R. Smith involved when Smith was on fire early. Jordan willed his teams to win. Lebron puts up great stats put still finds ways to let his teams lose. But he can still prove me wrong. We'll see what happens. I think it will still be a six or seven game series. BTW, I love Stephen Curry and I love Steve Kerr. They're both first class guys all the way. I do not understand the hate on LeBron and bringing up a comparison with MJ. What else could he have done after slicing a very good defense, best in the league, and dropping 40+ points on a team of superstars on nearly 50% shooting. He carried his team, a bunch of misfits and outcasts, through the playoffs missing Kevin Love and carrying along a 50% Kyrie. He did so by leadership and great team orientation and despite a less favourable media treatment and referee calls for him than Kobe or Jordan. The pair never won anything without a solid support cast, and are both bad teammates and bullies. Should never appeal to any Christian. The thing Gebre can never seem to grasp in his idolatry of Michael Jordan is that Jordan would not have won a single one of his six NBA titles without Scottie Pippen, Horace Grant, Dennis Rodman, John Paxson, and Steve Kerr. That LeBron was able to almost single-handedly bring his Cavaliers to the verge of beating one of the best teams in many years with a shot at the buzzer is a testament to his greatness. He willed his team to win, but he could only do so much without Kevin Love and with a beaten up Kyrie Irving. Hate to see Irving go down. Tough blow for the Cavs. But once again Lebron proves that he's not in Jordan's company. He had 24 seconds left with the ball in a tie game and he couldn't close the deal. And then he completely disappeared in OT. He also failed to keep J.R. Smith involved when Smith was on fire early. Jordan willed his teams to win. Okay, then, if Jordan willed teams to win, why couldn't he will his team past the Celtics and Pistons until 1991? In the 1987 Boston series, Jordan scored 63 points in one game, yet his Bulls still got swept. And his Bulls didn't beat the Pistons until after the Pistons had eliminated them in three straight years! Lebron puts up great stats put still finds ways to let his teams lose. But he can still prove me wrong. I think I've already proven you wrong about Jordan. We'll see what happens. I think it will still be a six or seven game series. Yup. I agree with that. More terrible news for the Cavaliers... Kyrie Irving now out for 3-4 months with a broken left knee cap. I don't hate Lebron at all. He seems like a nice guy. And I certainly don't think he's surrounded by a bunch of misfits and outcasts. He's got as much talent around him as Jordan did. And in Miami, he had much more talent around him than Jordan did. Yeah, Pippen was a great player, but Jordan helped make Pippen the player he was. But unlike Jordan, Lebron doesn't seem to know how to make his teammates better. Ask those who won championships with Jordan if he was a bad teammate. And if you want to bring Christianity into it, then I don't think betraying two cities that you profess loyalty to is very Christian. I lost respect for Lebron when he bailed on Cleveland, and then I lost more respect for him when he bailed on Miami after promising to win 7 NBA titles there. I guess if he doesn't win the title this year, he'll try to find a way to go to Golden State. You Lebron idolaters will never tire of making excuses for him. LeBron defenders. We don't idolize LeBron the way you do Jordan. You are the one who feels that Jordan's legacy as the GOAT is under attack. You are the one who feels the need to defend Jordan by praising him more than he deserves to be praised. You are the one who feels the need to tear LeBron down in order to make him look inferior to Jordan. I don't compare LeBron to Jordan. I don't feel the need to do so. I recognize that they're both great players, each in his own way. I just feel the need to defend LeBron against your unfair criticisms. Do remember also that you were the one who started this by disparaging what LeBron did last night. There was absolutely no need for you to do that, especially since no one said anything about either Jordan or LeBron. You only showed how defensive you are of Jordan's legacy. LOL! I'm not afraid to criticize Jordan. You, on the other hand, refuse to criticize Lebron. That's the problem with you Lebron worshippers. Anytime someone makes a legitimate criticism, you all start calling us "haters" and accuse us of "disparaging" him, etc. I didn't disparage Lebron, I simply pointed out that he failed to close the deal in regulation, and then disappeared in OT. And BTW, Jordan doesn't need me to defend his legacy. His legacy is just fine. I don't hate Lebron at all. He seems like a nice guy. And I certainly don't think he's surrounded by a bunch of misfits and outcasts. He's got as much talent around him as Jordan did. And in Miami, he had much more talent around him than Jordan did. Yeah, Pippen was a great player, but Jordan helped make Pippen the player he was. And Pippen helped Jordan become the player he was. It works both ways. But unlike Jordan, Lebron doesn't seem to know how to make his teammates better. That is about the most unfair assessment I've ever seen of LeBron. LeBron involves his teammates more than Jordan ever did, as can be seen from his assist numbers alone. LeBron's leadership both on the court and in the locker room has been praised this year in ways the it was never praised before. When he left for Miami, he did so with a lot of fanfare that indicated that he left for selfish reasons. When he returned to Cleveland, he did so with a lot more humility and with the determination to build a team that would win a title for Cleveland. The word about him this year is that he has been all about the team. Ask those who won championships with Jordan if he was a bad teammate. After he picked fights with Horace Grant and Steve Kerr? And if you want to bring Christianity into it, then I don't think betraying two cities that you profess loyalty to is very Christian. Has LeBron ever professed to being a Christian? If not, then don't hold him to the same standard to which others here just held you. I lost respect for Lebron when he bailed on Cleveland, and then I lost more respect for him when he bailed on Miami after promising to win 7 NBA titles there. I guess if he doesn't win the title this year, he'll try to find a way to go to Golden State. LeBron gained my respect by returning to Cleveland when he could have gone anywhere he wanted. The man returned to a city that hated him and to an owner who wasted no time eviscorating him in the most vicious ways possible when he left for Miami. Think about how much courage that took. Should that be eviscerating or excoriating? LOL! I'm not afraid to criticize Jordan. You, on the other hand, refuse to criticize Lebron. Why should I criticize him? The context you just set doesn't call for that. If you were to give a much more glowing analysis of LeBron's game, then I might be inclined to give a more honest and critical evaluation of him. But you're not giving a glowing analysis. Rather, you're seeking to tear down a man because he's a threat to your idol. Why, then, are you surprised that others have chosen to stand up in his defense? That's the problem with you Lebron worshippers. Anytime someone makes a legitimate criticism, you all start calling us "haters" and accuse us of "disparaging" him, etc. I didn't disparage Lebron, I simply pointed out that he failed to close the deal in regulation, and then disappeared in OT. Yes, you disparaged him. There are other ways to analyze what happened last night, but you chose to present an analysis that "proves" your case that LeBron is not yet in Jordan's company. Who really cares? And BTW, Jordan doesn't need me to defend his legacy. His legacy is just fine. Then why are you putting him on such a high pedestal? Do note one thing, Gebre: No one here criticized Michael Jordan until after you had first criticized LeBron James. eviscerate, but excoriate works just as well. LeBron James... Including last night, LeBron and MJ attempted the same number of such last-five-seconds shots in the playoffs: 11. LeBron connected on 6 of his attempts, Jordan on only 5 of his. Your consistent problem in this debate has always been that you confuse being a nice guy with making teammates better. I will agree with you 100% that Lebron is probably a much nicer guy than Jordan in many ways. I'm sure he's much less demanding and much easier to get along with in the locker room. But that has nothing to do with whether or not he actually makes his teammates better basketball players. And Lebron's statistics actually prove my point. Yes, he gets his teammates "involved," as his stats show. But his teammates never seem to actually become better players because of his influence. One of the intriguing things about sports is that stats often belie the real story. But you'd have to have actually played sports to know that. Which is why so many sports writers are full of BS. They are watching from their ivory tower without ever knowing what it's like to actually play the game. Well, let's ask Jordan's teammates what they think. I can only speculate, but I'm betting that 95% of them would have never wanted to trade Jordan for anyone else. You see, a true competitor just wants to win. They'll put up with a lot of crap as long as they know that those they step on the field or court with are gonna give it 100%. But again, you'd have to have played sports to understand that. Stavro brought Christianity into it, not me. There are those who will always be desperate enough to be grateful that an unfaithful lover returned to their arms. OK, can somebody PLEASE explain to me once and for all how to do the "quote" thing where I can respond to each particular point? I still have no idea how to do it, as evidenced in the previous post. PTA, can you tell me how? Your consistent problem in this debate has always been that you confuse being a nice guy with making teammates better. I've never said anything to imply that. LeBron makes his teammates better by creating open shots for them and passing the ball so they can hit the open shots. It has nothing to do with him being a "nice guy". LeBron makes his teammates better by sharing with them what it takes to win a championship. He never would have learned that if he hadn't played four years in Miami. I will agree with you 100% that Lebron is probably a much nicer guy than Jordan in many ways. I'm sure he's much less demanding and much easier to get along with in the locker room. But that has nothing to do with whether or not he actually makes his teammates better basketball players. No, it doesn't. Trusting his teammates to make shots makes his teammates better. And Lebron's statistics actually prove my point. What stats do you have that prove your point? I don't see any. Yes, he gets his teammates "involved," as his stats show. But his teammates never seem to actually become better players because of his influence. I don't know what you're looking at, then. One of the intriguing things about sports is that stats often belie the real story. But you'd have to have actually played sports to know that. Which is why so many sports writers are full of BS. They are watching from their ivory tower without ever knowing what it's like to actually play the game. OK, now you're meandering. Do try to stay on point. Well, let's ask Jordan's teammates what they think. I can only speculate, but I'm betting that 95% of them would have never wanted to trade Jordan for anyone else. Of course not! I'd be willing to bet, though, that 98% of those who ever played with LeBron never wanted to trade him for anyone else. You see, a true competitor just wants to win. They'll put up with a lot of crap as long as they know that those they step on the field or court with are gonna give it 100%. But again, you'd have to have played sports to understand that. Have you ever played sports? I have. And there are always those who will welcome the Prodigal Son when he returns home. Which is one of the significant differences between Lebron and Jordan. Whereas Lebron focuses on stats, Jordan actually trusted his teammates to make shots. J.R. Smith came out on fire in game one, but Lebron didn't trust him enough to keep getting him the ball. Jordan wanted win, and he would feed the hot hand, whoever it was. Some people seem to get a perverse thrill out of kicking people when they're down. Iverson has made his share of mistakes in life, but then again, who hasn’t? His mistakes certainly aren’t any worse than my own. But Iverson always gave 100% when it was game time, and he was an absolute warrior on the court. And he also clearly has a big heart. He has suffered tremendous injustices, adversities, and losses in his life, and all he wants is a little loyalty, a little forgiveness, and some unconditional love and support. Hell, I can relate to that! So stay strong A.I.! Some of us still love and appreciate you - not only for what you did on the court - but also for who you are as a person. In your successes and in your failures, you have always been real. And that’s a rare thing in this superficial world. Where do you get that piece of fiction? FWIW, Jordan was VERY focused on stats. Jordan actually trusted his teammates to make shots. Only after he bought into the principles of Phil Jackson's Triangle Offense. J.R. Smith came out on fire in game one, but Lebron didn't trust him enough to keep getting him the ball. You're too focused on Game One. What of the times earlier in this postseason when J.R. Smith had the hot hand and LeBron kept feeding him? Jordan wanted to be "the man" and win. He wanted to be the most important player on a winning team. He wanted to be the reason his teams won. He didn't care about winning in and of itself. and he would feed the hot hand, whoever it was. I think you're revising history here, for Jordan was not known for feeding any hot hand but his own. Maybe later in his career he learned to share the load, but early in his career he had the reputation, much like Kobe, of being a black hole--feed him the ball, and you'll never see it again. American Pharoah just became the first horse in 37 years to win the Triple Crown! Since you presume to judge Michael Jordan's heart, there's no way to have a reasonable discussion with you. You repeatedly attack Jordan personally, something that I have never done when critiquing Lebron. You obviously don't like Jordan, and that's fine. But your personal animus towards him severely clouds your objectivity in this debate. American Pharaoh won the Belmont Stakes and the Triple Crown today! Edit - didn't see the other post. Double yay! In my not-so-professional opinion, Michael Jordan was the best basketball player ever to play the game. I remember being completely mesmerized watching him play. Lebron, Kobe, Shaq and and company just doesn't have the same panache. Though Gebre, the only thing we can objectively judge players off of are stats. If a player makes his teammates better, it will show in the stats(Im not the biggest basketball fan, so pardon me if i go ahead and switch words arounds). For hockey, if a player X makes player Y better, then player Y will have more goals and assists with player X than player Z, and you can see this in the stats. The Tampa Bay Lighting win game 2 of the Stanley Cup Final 4-3 at home to tie the Chicago Blackhawks 1-1 in the series. Game 3 is Monday at Chicago. I've not said anything here that hasn't already been said by many or that hasn't already been published in a number of reputable sources. You can search the Internet and find everything I just said. No, I have only criticized his play on the court. something that I have never done when critiquing Lebron. You obviously don't like Jordan, and that's fine. On the contrary, Gebre, I have a world of respect for what Jordan accomplished on the court. At no time has the NBA ever seen such a perfect combination of freakish athleticism, basketball smarts, and cutthroat competitiveness as it saw in Michael Jordan. MJ was the best scorer ever and, in his prime, one of the best perimeter defenders of all time. No one can deny that he was the key reason why the Chicago Bulls won 6 NBA titles in a span of only 8 years from 1991-98--that in itself is a testament to his greatness as a basketball player. But let's be realistic about his legacy. Let's not make Jordan out to be what he was not. But your personal animus towards him severely clouds your objectivity in this debate. I think I'm actually being quite objective in my assessment of Michael Jordan. You have shown that you will take any opportunity you can to diminish LeBron's performance on the court and praise MJ as the model against which LeBron and all others are to be compared. When you then revise history to make Jordan out to be a basketball demigod and a force of altruistic selflessness on the court, something he never was, I only have to laugh at how preposterous your idolatrous image of the man is. What makes it even funnier--or sadder, depending on how you look at it--is that you will defend your idol even when no one is criticizing him. If I had never tried to tear down your idol, your praise of him and your criticism of LeBron would still be on this thread. I only offered my less than glowing assessment of Michael Jordan's legacy because you had already taken the initiative to put him on a pedestal.